When selecting a pump it is important to take into consideration the materials used in its construction. While some materials may be an up-front low-cost option, if they are used in the wrong application it can become more expensive in the long-term due to premature failure or unexpected servicing and replacement costs. Anton Merry, Managing Director at Sterling Pumps said there are a number of factors that need to be taken into consideration when selecting a suitable material for a pump. “One of the main factors affecting material selection is the components of the pump. Pumps can be constructed using a variety of materials, so the material used for individual components should be selected based on what will perform best and have the longest life for a particular application,” Mr Merry said. These properties will determine what temperature range the material can withstand, as well as if it is resistant to the abrasive, corrosive and erosive properties of the liquid. If a component is constructed with a less appropriate material it will wear-out faster and require more frequent servicing and replacement. Another important factor is fluid velocity and service conditions. A pump that sits idle for long periods of time will experience a different rate of corrosion than one that operates continuously. Likewise, a material might have good corrosion resistance against fast flowing water, but when the fluid is stagnant it may be more susceptible. As materials have different properties it is important to choose the correct pump for the specific application and environment. Mr Merry said cast iron is a popular choice for casings as it’s the lowest cost material to cast, making it a cheap option for pump users. Cast iron pumps have thicker walls – making it resistant to shocks and knocks – and are easy to maintain and repair if damaged. 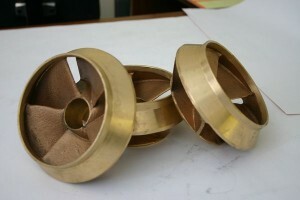 Bronze is another standard and cheap pump manufacturing material. 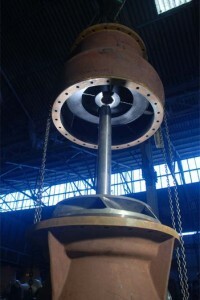 It’s used most commonly for impellers as its corrosion, erosion and cavitation resistance is higher than cast iron. Bronze has a high resistance to chlorides making it a good choice for seawater, power generation, and offshore gas and oil applications. It is also good for aggressive bore water environments. Duplex and super duplex are high grade stainless steels which have a high resistance towards corrosion. They are suitable for a wide-range of applications, including water treatment, seawater, fire pumps, and oil and gas. In particular, they are highly resistant to localised corrosion such as crevice, intergranular and stress cracking. Super duplex also has a Pitting Resistance Equivalent number (PREn) of 40, making it one of the most corrosion-resistant materials available. Unlike lower grades of stainless steel they are suitable to be used in environments and applications that contain chloride, phosphoric, or organic acids. “Duplex and super duplex are currently the go-to materials for demanding applications such as offshore oil and gas as they provide superior function and longevity in aggressive environments,” Mr Merry said. While Mr Merry said they some of the best materials available for manufacturing pumps they are also harder to weld, machine and cast than other materials. 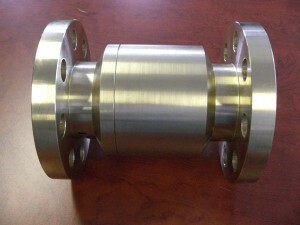 They require experienced manufactures to cast the metals to ensure the final product will last. “Sterling Pumps has been manufacturing pumps with duplex and super duplex for 10 years so we understand how they react to the manufacturing process,” Mr Merry said. Zeron 100 is a highly alloyed stainless steel, developed by Sterling’s sister company Mathers Foundry, for use in aggressive environments. Mr Merry said Zeron 100 is currently the best pump manufacturing material available for seawater applications. “We use Zeron 100 to manufacture pumps that are installed in aggressive environments because it has excellent corrosion resistance with a PREn of >40. It’s resistant to a wide range of organic and inorganic acids as well as strong alkalis and many non-oxidising acids. This makes it an attractive choice for a variety of industries. “It’s not as popular as duplex and super duplex but it becoming more widely used, especially in oil and gas applications, because it has a long life, reduces long-term costs, and requires minimum maintenance,” Mr Merry said. Zeron 100 is also high strength, which enables reduction in the wall thickness in a number of instances, providing cost reductions. “There are a lot of factors that play a role in deciding what material to use and what pump parts they are suitable for,” Mr Merry said. “Seeking expertise is important to ensure the right material is chosen. For instance, buyers need to choose a material that will provide certain clearances for their application. “Corrosive elements also need to be considered, such as water temperature. The hotter the water, especially seawater, the faster pitting corrosion on stainless steel will occur.